Have a pasture or a rough hillside that's being taken over by weeds? Are your fields too saturated to reach with your large sprayer? Need a new turf sprayer? 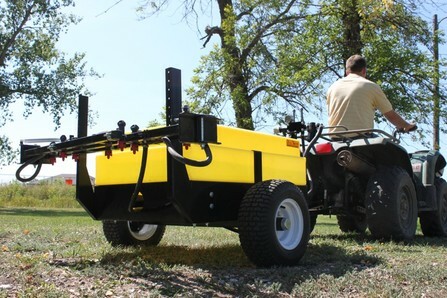 Manage it all with a 50 or 100 gallon ATV Skid Sprayer from F/S Manufacturing! Choose between a 7 gallon per minute electric pump and a 4 HP Honda gas engine - driven centrifugal pump. 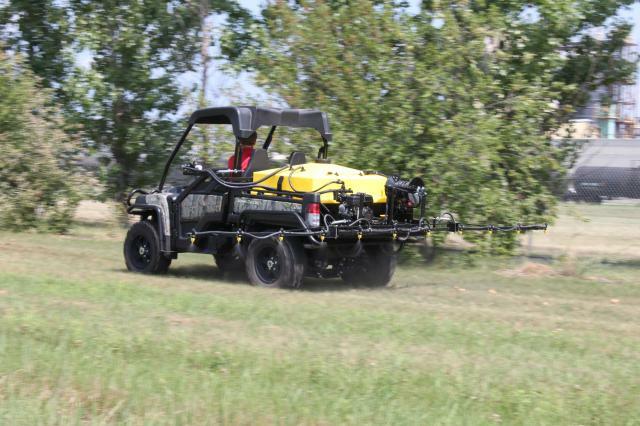 Choose between a 12' or 18' boom for even coverage in flat terrain, or put Boomless Nozzles on it to spray the steepest, roughest hillside you need to manage. With a Spray Gun and hose reel now standard equipment, your Skid Sprayer will also function as a Spot Sprayer. Spray your fence rows and around bins, or upgrade your spray gun and get even coverage all the way to the top of your trees. Our ATV Skid Sprayers fit nearly all brands of Utility Vehicles, so whether you've got a John Deere Gator, Polaris Ranger, Kubota RTV, Honda Big Red, Arctic Cat Prowler, Kawasaki Mule or some other UTV, we've got you covered. Empties to the Last Drop!